It's a well-known fact that the world has shrunk dramatically in the last half-century. Journeys that used to entail weeks or months of treacherous conditions at sea can now be completed in mere hours. The availability of fast and inexpensive flights means that travellers can easily visit any number of once-thought exotic destinations. But this apparent freedom comes at a cost. With our eyes fixed on distant horizons, it's all too easy to forget the treasures closer to home. The British Isles are home to some of the most stunning and varied landscapes on the planet - from rugged mountains and dramatic coastlines, to rolling hills and majestic rivers. There are no fewer than fourteen national parks in the United Kingdom, just waiting to be explored. And all of this is right on our doorstep - if only we can bear to leave behind the urban shackles of our cities and motorways. Of course, many of us do just this, and the popularity of the countryside is clearly demonstrated by the inevitable bank holiday traffic jams. 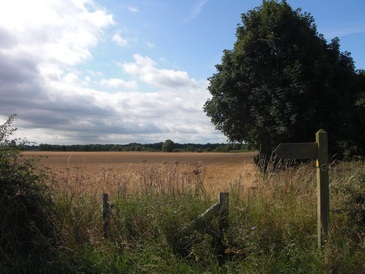 But the tourist hot-spots that we so readily flock to are bound by the fate of easy access - doomed to be nothing more than a sanitised and watered-down glimpse of what the countryside has to offer. For all this criticism, I cannot deny that such tourist traps cater to the wants of many, if not the majority, of visitors. But for those of us who truly want to experience the great outdoors, it goes without saying that the car must be left behind. There is nothing more rewarding than to reach an objective by foot, whether that involves climbing over windswept mountains, or strolling through tranquil woods. The most important thing is the sense of freedom this gives you - allowing you to explore otherwise unreachable places, at a pace where the surroundings can be taken in and appreciated. Walking can be enjoyed on many levels, but the finest journeys are those over long distances. There is something very primitive about setting off on a long journey with nothing but your own legs to carry you, and it really gives you the chance to absorb yourself in the surroundings. 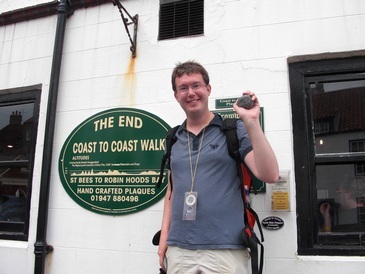 There are several long-distance walks in the United Kingdom, but the subject of this account is of one in particular - the Coast to Coast Walk. Since it is the only long-distance walk I have attempted, I cannot claim with authority that it is the best of them. What I can say, however, is that if there is a better walk in terms of variety of scenery, excitement, and comradery, then it must be truly remarkable. Alfred Wainwright was a pioneer when it came to exploring the Lake District, and making its many peaks accessible to walkers. 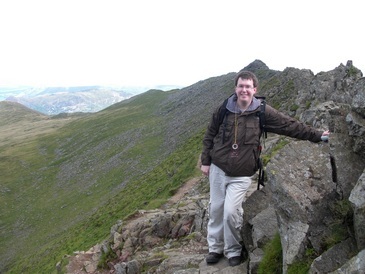 After completing his pictorial guides to the lakes, he set out on a new challenge - to construct a walk between the East and West coasts of Northern England, connecting the Lake District, the Yorkshire Dales, and the North York Moors national parks. 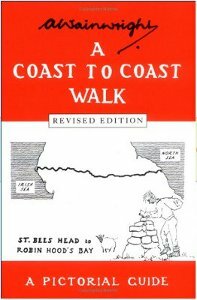 In 1973 he published his account of such a walk, and it has become a firm favourite amongst long-distance walkers - ranked as one of the best in the world. There is no fixed schedule for completing the walk, but most people take between 12 and 16 days. I have always enjoyed walking, but until doing the Coast to Coast I had never walked for more than one day at a time. I was trying to decide upon a holiday in 2009, when it occurred to me that this would be a fantastic choice. I was coming to the end of my PhD, and about to start a position in Denmark, so why not make the most of the English countryside while I was still nearby! Not only this, but the friend I was previously planning to go on holiday with wasn't able to get time off work, so of all the holidays to do by myself, this seemed to be ideal. I was sure to meet plenty of people along the way, so I thought, and it would be great to spend lots of time in the fresh air. As it turns out, I was right - and the walk even exceeded my expectations. I made many new friends along the way, and I was perfectly capable of physically walking the distance, if a bit tired by the end of it! I didn't have much time for preparation, other than a few walks in the hills around Edinburgh, and climbing Arthur's Seat. I would say that while the walk is challenging, anyone with a reasonable level of fitness can complete it - the only thing needed is determination and a love of the outdoors. For me, it was an unforgettable experience, and I would recommend it to anybody thinking of a long walking holiday. Just remember that the terrain is not easy, and it is far from flat! I decided to do the walk in 13 days, during the first two weeks of August 2009. Since I didn't feel comfortable with carrying everything (I wanted a holiday, not an ordeal), I used the Sherpa Van Project, which transported my bag between my accommodation each day for a small fee. I stayed in Bed and Breakfast accommodation along the way, and I was very pleased with the quality and variety of places I stayed at. Some people enjoy camping, but I'd much rather have a warm shower and a comfy bed at the end of a long day! In these pages, you can find an account of my experiences. For those people that I met along the way, please get in touch if you are reading this - especially if I get your name wrong (as I'm sure I will have done for a few people). Below you can find a summary of each day, and clicking on the picture (or using the menu to the left) will take you to a more detailed account of each day, with many more photos. Enjoy! The original and definitive guide by Wainwright. This is a must-read for the engaging narrative, hand-drawn maps and illustrations, and endless nuggets of information. I personally didn't use it as my primary source of navigation, but it would easily serve this purpose since the revised edition points out recent changes to the route. 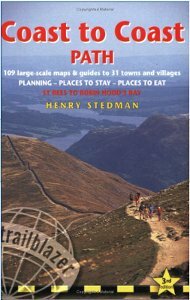 The Trailblazer guide by Henry Stedman is truly excellent. I used this throughout the walk, and I didn't get lost a single time! The places where people often get confused are clearly explained, with useful instructions of the form "ignore the obvious-looking path to the left". 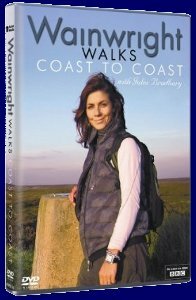 This recent BBC series, presented by Julia Bradbury, gives a good overview of the walk. 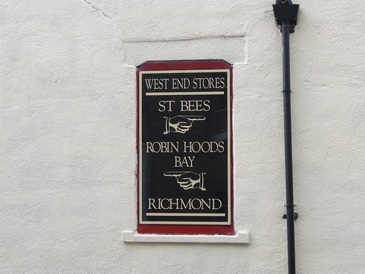 This is interesting to watch both before and after the walk - in the latter case, it is enjoyable to recognise the places you have visited along the way. 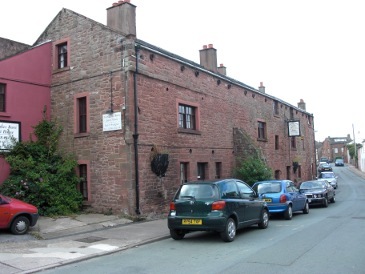 The journey began, as I arrived in the West Cumbrian village of St. Bees. A visit to the aptly named "Wainwright's bar" was of course in order, before getting an early night in preparation for the first day of walking. 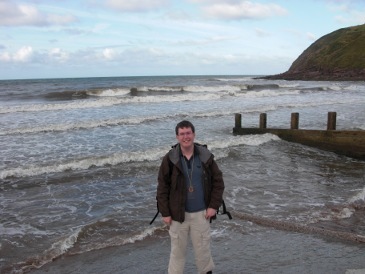 After dipping my toes in the Irish Sea, I enjoyed a lovely walk around St. Bees head before turning inland. I met Nicole and Arnout, and walked with them for the rest of the day. We travelled through the villages of West Cumbria, stopping in Cleator for lunch, before climbing the hill of Dent. A steep decent followed by a stroll through the Nannycatch valley took us into Ennerdale Bridge and the lakes. I had breakfast with Nicole and Arnout, and met Nick and Kate, at the Fox and Hounds. The day began with a clamber over the rocky Southern shore of Ennerdale Water, after which we took the scenic route to the south of the River Lisa. 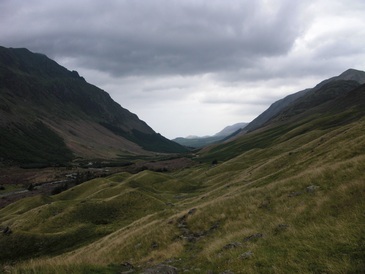 Lunch at the Black Sail Hut was followed by the steep ascent of Loft Beck, and the views were stunning. We descended via the Honnister slate mine, arriving into Borrowdale in time for a pint at Rosthwaite, before I had to head to my lodgings in Stonethwaite. I woke up to miserable weather, and made my way up Greenup Gill in the rain. As the visibility got worse, I waited for the couple behind me to catch up, and we navigated over the top, gathering others including Nick and Kate along the way. 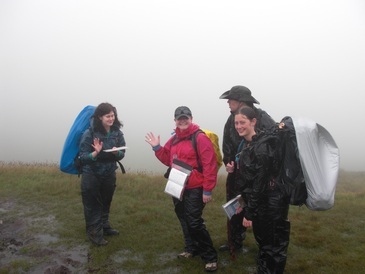 After wading through rivers, we arrived into Grasmere looking sodden and feeling worse. Luckily the weather brightened up later in the afternoon. The weather was beautiful, in stark contrast to the previous day, and I set off up Little Tongue Gill to Grisedale Tarn. 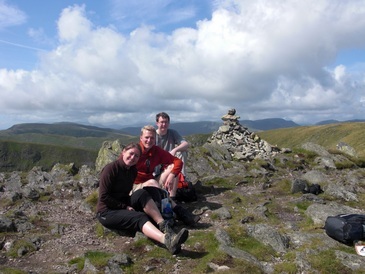 As I was resting, Nicole and Arnout caught up, and we decided to climb Helvellyn. It was a perfect day for it, and Striding Edge was busy but great fun. We descended into Patterdale and sat outside in the village green. In the evening, I was surprised to find Judy - my old piano teacher - and her husband Bruce turn up at the pub, also doing the walk! I set off with Nicole and Arnaut, climbing up to Angle Tarn and onto Kidsty Pike. It was another beautiful day, and the views were stunning. It was a fairly steep decent down to Haweswater, but then a hot and miserable trudge alongside the reservoir - mostly behind a plantation. At the end, we left the lakes for the last few miles of rolling farmland, before arriving in Shap. I had dinner with Julie and her mum (Americans from Oregon that I first met in Grasmere). 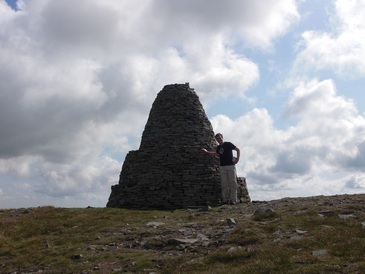 I set off alone, passing over the M6, and onto the limestone plateau of Westmorland. I visited the Oddendale stone circle, and took a detour to Orton for lunch. On leaving, I bumped into two ladies - Jane and Marie - who I joined for the rest of the way to Kirkby Stephen. It was a long day, and it felt like it! We passed Sunbiggin Tarn, and over Smardale Bridge, before arriving in Kirkby Stephen - where I met Nick and Kate, and Nicole and Arnout. This day marked the crossing of the Pennines, and I set off on the climb - which didn't seem to take as long as I thought it might. At Nine Standards Rigg I met up with Nick and Kate, and Mike (a lone-walker from Hull), and we set off down through the peat bogs. Arriving in Ravenseat, it was great to find the farm was serving refreshments, and I had the best cream tea of the walk! We continued the last couple of miles into Keld. I set off in good time, and decided to take the low route, starting with a detour to Muker. As I rejoined the main path, I heard a shout behind me, only to find it was Nicole and Arnout, and Judy and Bruce. 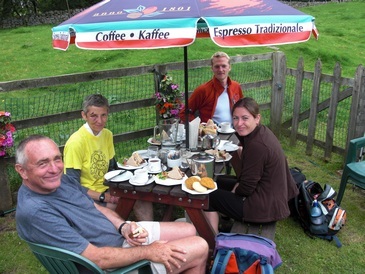 We continued together, stopping off in Gunnerside for sandwiches, cakes and tea! 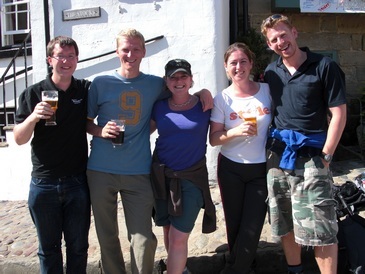 Since this was a short day, we arrived in Reeth early in the afternoon, in good time. I had dinner and a few drinks with Nick, Kate, Nicole and Arnout. This was another short day, and fairly overcast. I bumped into Sam and his dad, Martin, shortly after setting off, and joined them for a bit. 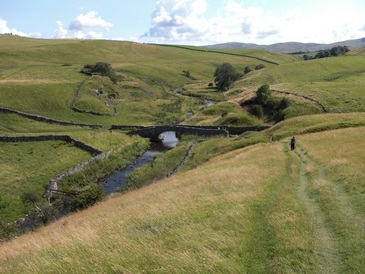 The walk took us over farmland, with a small ascent by Applegarth Scar, before arriving into Richmond. I had fish and chips for lunch, then found my lodgings. I took the chance to get some light-weight shoes for the road walking ahead, and in the evening went for an Indian (exotic!) with Nick, Kate, Nicole and Arnout. I had a long day tomorrow, and would leave them behind for the remainder of the walk. I set off as early as possible for this long day of 25 miles. The countryside near Richmond was pretty, and I passed through several villages, pausing in Bolton on Swale to see the churchyard. The rest of the day was a mixture of road walking and farmland, crossing the Vale of Mowbray, with a short stop in Danby Wiske for lunch. I pressed on, and eventually reached the A17 and Ingleby Cross. After stopping for a pint and to recover some energy, I pressed on for another hour of walking - up through the Arncliffe Woods and down into Osmotherly. 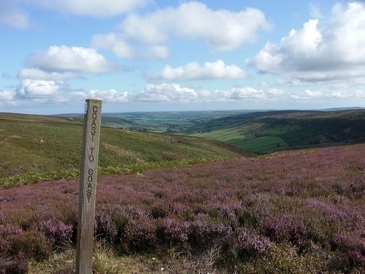 I turned out to be staying at the same place as Julie, and since her mum wasn't walking, we set off together into the North York Moors. It was lovely crossing the Cleveland hills, though a lot of up and down. 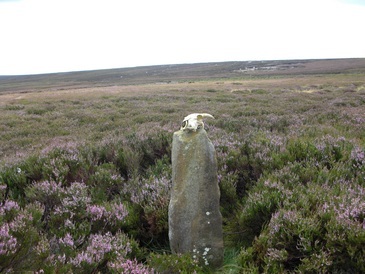 We stopped for elevenses at the Lord Stones Cafe, and then for lunch at the top of Urra Moor. The last eight miles across the moorland felt very long, but we eventually arrived at the Lion Inn, and had a great evening. This was a much shorter day, starting with a walk around the heads of Rosedale and Great Fryup Dale, before descending from the moors via Glaisdale Rigg. I arrived quite early in Glaisdale, and had lunch at the pub, before casually strolling through the woods to Egton Bridge. I arrived in plenty of time, and enjoyed an afternoon tea, before resting away the remainder of the afternoon. The final day of the walk began with a short stretch to Grosmont, before climbing steeply out of the valley onto Sleights Moor. I then descended into Littlebeck wood, passing by the Hermitage, and stopping for elevenses at Midge Hall. There was a final climb over the moors, and before long I was arriving in High Hawsker, where my Mum and Dad, and my brother Ali were waiting. We had lunch, and then set off on the last few miles around the coast, arriving in Robin Hood's Bay in time to meet the others - including Julie - at the Bay Hotel. Chris, my other brother, also arrived, and I dipped my toes in the North Sea, before enjoying a victory pint. I had dinner with my family in the evening. My train back to Edinburgh was later in the evening, so I went with my parents and Ali up to Whitby for the day. We went round the town and on a boat ride, and saw a few events going on at the Abbey. We went to Sleights for afternoon tea, before returning to Robin Hood's Bay - in time to meet Nick and Kate, Nicole and Arnout and Judy and Bruce, as they arrived at the finish line. There was time for one last pint before we had to part ways. Overall, it was a fantastic experience!